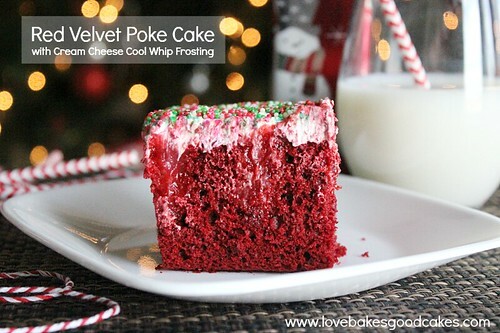 This Red Velvet Poke Cake with Cream Cheese Cool Whip Frosting is perfect for Christmas! Since Christmas is just a few short days away, I have to ask – are you ready?! I don’t know about you, but since Thanksgiving was so late in November this year, it has made December feel that much more hectic. I haven’t even thought about New Year’s yet! I procrastinated shopping for gifts this year until after Thanksgiving …. Normally, I try to buy things throughout the year. That just didn’t happen this year. Thankfully, my shopping is done now, and everything is wrapped! Woo-hoo! How about you – are you still shopping? Do you still have things to wrap or are you ready to go on Christmas morning?! Just a note before we get to the recipe – If for some reason you cannot find the white chocolate pudding mix listed, you can substitute vanilla! 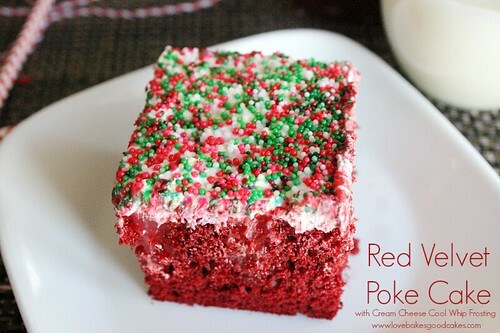 The perfect poke cake for Christmas! 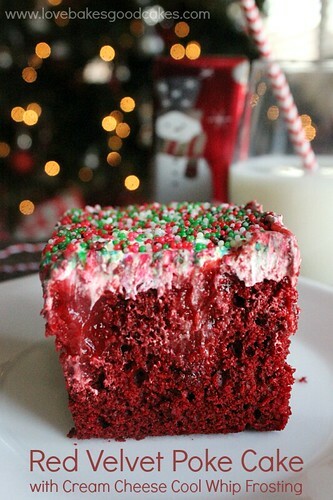 Bake cake according to mix instructions using a 9x13-inch baking dish. After the cake has baked, remove from the oven. Using the handle end of a wooden spoon, poke holes all over the cake. There is no set number of holes, but you want plenty of places to fill. Mix the white chocolate pudding with 2 cups of milk until dissolved and creamy. Pour the pudding evenly over the cake, trying to fill the holes as much as you can. You may need to use the back of a spoon to help push the pudding into the holes. In a large bowl, mix the cream cheese, Cool Whip, powdered sugar and vanilla until well combined and the mixture is light and fluffy. Spread over the top of the cake. Sprinkle the non-pareils over the top. Refrigerate for at least 4 hours before serving. I love easy desserts! 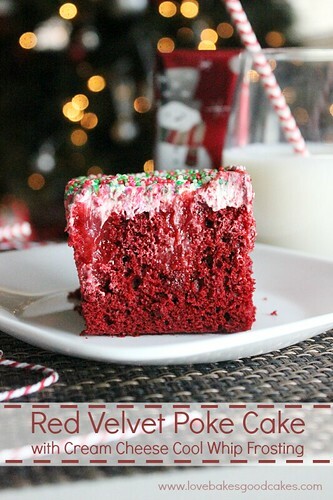 This one looks so festive – If you’re looking for an easy holiday dessert idea, give this Red Velvet Poke Cake with Cream Cheese Cool Whip Frosting a try! Don’t forget to check out these other easy poke cakes on All She Cooks: Chai Spice Poke Cake or Pineapple Poke Cake?